Giovanni Battista Ferrandini is not exactly a household name. But one of his compositions, Il pianto di Maria has become famous, because for a long time it was attributed to George Frederic Handel. It was included in the catalogue of Handel's works as HWV 234, and it is still performed under his name now and then. However, this attribution is based on a manuscript from the early 19th century (not the 18th, as the English translation of the liner-notes says). In 1989 Paolo Cattalan, who is the author of the liner-notes to the present disc, found a copy in the library of the Italian composer and theorist Giovanni Battista (Padre) Martini, written in his own hand; it mentioned Ferrandini as the composer. For about two decades Cattelan carried out a research on the life and career of Ferrandini. He discovered that the composer was born in 1709 - instead of 1710, as New Grove has it - as the son of an oboist who played in theatres in Venice. He brought his son to Munich in 1722 where the latter probably played the oboe as well as the transverse flute. This explains the publication of collections of sonatas for either instrument; a set of six flute sonatas was printed as his op. 1 in Amsterdam in 1737. Ferrandini was well appreciated in Munich; his ennoblement bears witness to that. It was also Ferrandini who composed the opera with which the Residenz-Theater - which is still in use - opened in 1753. He was also active as a voice teacher. One of his students was the tenor Anton Raaff, who sang the title role in the first performance of Mozart's Idomeneo. In addition he was the music teacher of Max III Joseph - son of Karl Albrecht - who became Elector in 1745, and who played the viola da gamba at a professional level. He also taught Max III Joseph's sister Antonia Walpurgis who composed two operas. In 1771 Leopold and Wolfgang Mozart visited Ferrandini in Padua, where he was living at the time. The programme on this disc opens with Il Pianto di Maria, subtitled "a sacred cantata to be sung before the Holy Sepulchre". It seems to have been one of three pieces "for performance at the Holy Sepulchre". Maybe another cantata in Padre Martini's archive, which bears the same indication, is also one of them. It doesn't surprise that Il Pianto di Maria is regularly performed. It is a very dramatic piece in which not only the voice but also the strings express the text in a sometimes very drastic way. The cantata begins with a recitative in which the events leading to Mary's lament are described, like by a testo in the 17th-century Italian oratorios. Then Mary comes in, singing a 'cavatina'. The vocal line is rather simple, moving up and down in a quiet tempo. It is the strings which express her grief most strongly, with some heavy dissonants. This is followed by another recitative, beginning as recitativo secco, but turning into a recitativo accompagnato when the acts of several people are mentioned: "[Betrayed] by one disciple, denied by another, shunned by the most faithful, condemned as a criminal by an unjust court". The strings continue by depicting the scourges, the thorns, the nails, with some forceful chords. The description of Christ's misery ends with the words "forsaken by Heaven". The strings fall silent, and Mary continues: "Is it not enough that I must hear his fair name uttered amid the blasphemies of this barbaric crowd?" Then the cavatina is repeated, after which Mary sings another recitative with basso continuo, which falls silent on her closing words: "Ei muore, Ei muore!" (He dies, He dies!). The next aria, in which Mary talks about her "mournful sighs" and her Son's "grievous torments", is full of strong dissonances and fierce chords in the strings. In the following accompanied recitative the strings vividly depict the earthquake which accompanies Christ's death. It ends by looking forward to the future: "God decreed that three earthquakes would strike across the earth: one at the death of the Word, one at the resurrection, and the third - alas, I tremble at the thought of what may come to pass - at the Final Judgement". The last aria is dominated by descending lines, which contain strong chromaticism toward the end of the A section. The cantata ends with a short accompanied recitative: "Now if the earth did shake at the horror of witnessing God's death in such agony, tremble, man, for you are earth!". After the voice falls silent the strings close the cantata with whipping chords. The second piece on this disc is from another source: the manuscript is preserved in the Staats- und Universitätsbibliothek Dresden. It is part of the Sächsische Landesbibliothek which includes the musical archive of the once famous court chapel in Dresden, among whose members were such famous masters as Pisendel and Zelenka. It is likely that this piece was once owned by Maria Antonia, daughter of the Bavarian Elector Karl Albert who married Friedrich Christian (1722-1763), the Crown Prince who became Elector in 1763 and died of smallpox after only 74 days. It is interesting that this cantata includes obbligato parts for the lute and the viola da gamba. We already saw that Max III Joseph, Karl Albrecht's son and Ferrandini's pupil, played the gamba at a professional level. It seems likely that the viola da gamba part of this cantata was intended for him. O spettaculo pur troppo funesto focuses on the dialogue between Jesus and one of the thieves on the Cross. It opens with a recitative: "O what a disastrous spectacle, horrendous, unheard-of ingratitude. (...) And you, ungrateful, with fierce cruelty, in barbarous fury, would crucify your Creator?" It is followed by a very long dacapo aria, lasting 12 minutes: "Behold your God, the bleeding wounds, the lacerated veins". It is a piece of great intensity, to which the viola da gamba and the lute contribute considerably. They return in the ensuing recitative: "Consider, ye Christians, at least the vastness of his Divine Love". That love is demonstrated by the dialogue between Jesus and the thief. The latter's plea for mercy and Jesus' answer have the form of accompanied recitatives. The piece ends with an aria in D major which has a more uplifting character: "Rejoice and be glad, for the lost Elysian Fields are found once more, in the Divine Paradise that Christ opens up four you". If the other piece(s) "for performance at the Holy Sepulchre" would come to light, that would be really great, because the two compositions performed here are very expressive and musically rewarding. Apparently Ferrandini was a master in the expression of a text. He never goes over the top. Some of the recitatives are very dramatic, but in the arias Ferrandini is more restrained. Precisely that makes them all the more expressive. Roberta Invernezzi has found exactly the right approach to these works and delivers very incisive interpretations. There is no lack of drama in the recitatives; at such moments she sometimes uses a bit too much vibrato. Her breath control is admirable, especially in passages with long lines which are sung piano. It is just a shame that the instrumental parts in Il Pianto di Maria are a little pale in comparison; the dissonants and the depiction of the text, especially in the accompanied recitatives, should have been more explored. The parts for viola da gamba and lute in O spettacolo are given splendid performances by the members of gambe di legno. 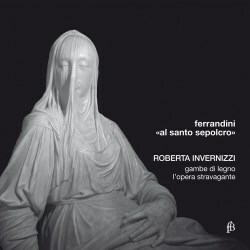 Other good recordings of Il pianto di Maria are available, but O spettaculo pur troppo funesto is a real find and confirms Ferrandini's qualities. This disc is a substantial addition to the catalogue of music for Passiontide.